1. To focus on growth in learning rather than merely look at the summative assessment task. 2. To give "Reflection" a chance as it competes with the other Seisen Learner Profile Attributes! 3. To encourage the shift from teaching to learning. Student agency is encouraged in our school and what better way to do this than have them lead and steer conversations! 4. The use of transdisciplinary skills- especially communication and thinking skills as they strive to be clear and answer their parents queries. The students created centers where they spoke in detail about the their unit of Inquiry, mathematical concepts and all the strategies they have learned during the reading and writing workshops. They also shared websites they created in order to showcase a cause they were interested in. Their e-portfolios helped them organize all their relevant work and came in very handy when their parents had more questions about a topic. It would be remiss not to thank the parents in this post. They were cheerful, supportive and showed us what good listeners and critical thinkers did while interacting with others. The students left the classroom with a cheerful smile. Thank you from all of us in Grade 6. You consolidated our learning experience! In preparation for the teamwork required during Exhibition Grade 6 students focused on their core competencies in the MC. After tracing their hands and reflecting on their own strengths the girls then allocated a finger on their hand to each of their team members. They selected the strengths each girl can bring to the team. These included skills, attitudes and personal attributes. A video followed which exemplified the importance of knowing your own core competencies so that you can lead others as appropriate. 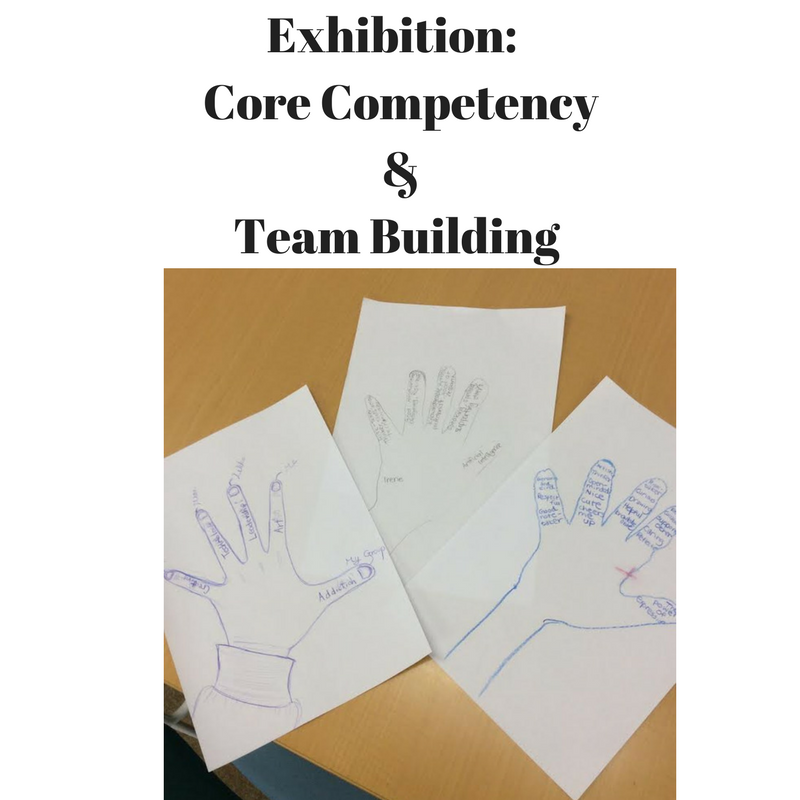 You can watch the hare and the tortoise here as they discover the advantages of teamwork.At the conclusion of exhibition we will revisit the ‘hands’ and reflect on how our knowledge of others has improved and what opportunities were presented to showcase each student's core competences. Most groups have successfully come up with lines of inquiry by now and are beginning the investigation stage of their inquiries. Mr Hawkins works on team building exercises with the Biome A groups. Ms. Brittany works on team building exercises with Biome B groups. Students have to think a lot about their questions and key concepts to decide on lines of inquiry. "Where we are in place and time" is the PYP TD theme that comes to mind when I think of one class event this week. It became clear from the timid, meticulous opening of envelopes on the carpet that the Grade Six students of today are not familiar with "snail mail", but they love it! Each student received a letter from a Grade Six student at Duleek National School, Co. Meath, Ireland. Students are busily writing research based information books at the moment but are happy to take a short break from that to flex their letter writing muscles and reply. We will collect replies and post them from school next week. We (Grade 6) would like to know how many of our readers actually use letters to communicate these days. Please take a moment to complete the survey attached.